LAte flowering lilac with small creamy white bloom clusters. Hardy to -40F(-40C); height: 12ft. Bushy shrub type lilace with slender clusters of slightly fragrant deep lilac to violet blooms in spring. Late flowering. Hardy to -40F (-40C); height: 12ft. Tiny leaves and blooms distinguish this species. Lilac colored blooms in spring. Hardy to -20F (-28.8C); height: 12ft. 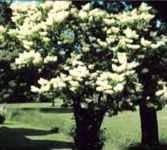 This Chinese native is one of the earliest flowering lilacs, with dense clusters of pale lilac blooms. Hardy ot -30F (-34.4C); height: 12ft. Native Chinese lilac with small leaves and whie blooms tinted with purple or pink. Hardy to -30F (-34.4C); height: 18ft. 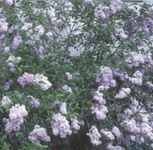 Dense clusters of lilac colored blooms on a rounded shrub. Highly fragrant. Hardy to -30F (-34.4C); height: 5ft.